Print P271 is from the Landscapes Series. Reference Drakard, David and Holdway, Paul. Spode Transfer Printed Ware, 1784-1833. Woodbridge, Suffolk, Antique Collector's Club, Inc., 2002. Shown here is a view of the side of the jug revealing the shape of the handle. 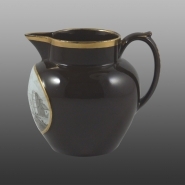 A Dutch shape milk jug, the red earthenware body is coated with a dark brown slip except for an oval cartouche beneath the lip which has a white slip ground within a gilt border. The cartouche has a black bat print of a castellated building with a horse and figures in the foreground. There is additional gilding to the rim and handle.